The second chapter of 'ZERO YEAR - SAVAGE CITY' reveals an entirely new Gotham City. Unraveling the mysteries set forth by the Riddler, Batman must learn to work with his new ally, Lieutenant Jim Gordon, and do whatever it takes to survive! 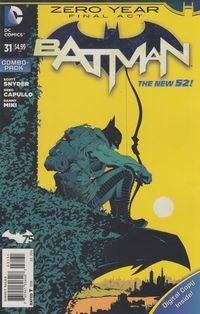 This issue is also offered as a combo pack edition with a redemption code for a digital download of this issue.